UPDATED Jan. 16: The animated GIF is comprised of a dozen or more still photo frames shot within about 4 seconds. Each was cropped exactly the same. One of these frames is the featured photo. Neither the GIF nor the main photo were taken from video. VATICAN CITY — Photographers covering the Vatican are witnesses to both the grandeur and ordinariness of the events that unfold here. 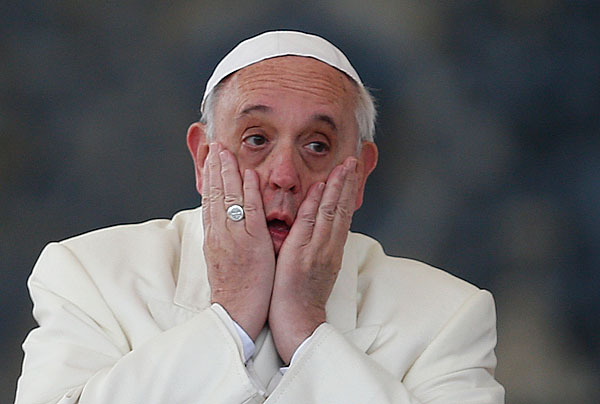 In a display of the ordinary, today I shot this unusual frame of Pope Francis as he rubbed his face. He had just finished delivering his blessing at the end of his catechesis at the Wednesday general audience. The 77-year-old pope first rubbed his eyes, then his face. It was essentially the pope’s four seconds of down time before spending the next hour and a half greeting bishops, people with disabilities and many others. My colleagues and I frequently see the pope doing ordinary human things: blowing his nose, taking a drink of water, scratching his face, etc…. We’ll sometimes photograph these moments but usually don’t use them. There is a certain sense of decorum among us — about what is appropriate for public consumption and what should be kept private. In this case, the photo seemed to convey just how tiring it is to lead an audience and greet so many people outside in winter weather for two and a half hours. My colleagues at the Rome bureau liked the photo because it showed a certain vulnerability. What do you think? I loved the photo……….it showed exactly what you said in your last sentence…….a certain sense of vulnerability!!! He is a human being, not God and I truly believe he would be the first to state that fact! I love Pope Francis because he is such a human being and takes great pride in it and the fact that as humans, we have so much access to help and resources to make this world a better place if only we made the commitment to do so! His work is tiring but he performs it with great love of humanity and love for his God and His will for our Blessed Church Father!!! Afterall he is a human being just like all of us. …oh to have those holy and venerable hands touch my own face. Even he must feel the power and presence of the Lord in his own hands. Given today’s generation of folks who like to make memes, I think this one should have never come out. Yes, we all do ordinary things. The Pope is human! Why do we need to remember him wiping his face? Sometimes, most of us dont think these persons do ordinary things that we do, its really ‘different’ to experience. @Jeff, I can’t bt agree with you on those hands. I love seeing this! It shows another way he understands us, that he is one of us in some ways. Don’t we get a little sleepy sometimes…I mean yah..come on…it was a break…he’s human! It helps non-Catholics and some Catholics, realizing we KNOW the pope is just a human being. No, we don’t think he’s inexhaustible God! I love this! It’s nice to get to see the “humaness” of someone so highly respected. It brings him closer to his people, I believe. God Bless Pope Francis now and forever! To me, it shows that he is not a super human being. He is one of us and he tires, he stresses, he grows weary. God bless our Pope and give him the strength that he needs. Amen. Something about it is endearing. . I was just thinking how I would feel if me rubbing my face was blog worthy. You can see how easily a photo can be used out of context, and just as easily selected from a video. I would love to hear what the Holy Father would caption the photo! Excellent shot, Paul! Meanwhile, do you know if the pope uses hand sanitizer before, during and/or after shaking those many hands following his general audience? I’m sure doctors, nurses and other health-care professionals around the globe would appreciate a picture of the pope exercising proper hygiene by applying Purell to his palms, especially during the height of flu and cold season. Gostei da foto, nos mostra como ele é simples e normal como ele mesmo disse quando veio ao Brasil, carregando sua própria maleta de mão. Ele faz coisas simples mas mesmo assim nos mostra a sua grandeza pela FÈ, Humildade, Carinho e Amor. I liked that you showed him as human. I cannot imagine what a tiring, cold and long time in the cold he endures. I think he has a very difficult job, but is doing a great service to all people in Christ’ name. He is a human being like us… Love him.. I love it. It’s refreshing to see the pope in a “human moment”. I’m sure Jesus did the same thing many times. It helps us remember that the pope is one of us and feels hungry, tired, sad and happy. He’s not a wind-up puppet. Keep these special glimpses coming. I love Pope Francis and this shows his humanity. We all feel tired at times after working. God bless him and strengthen him for the work ahead of him. I can just imagine that Jesus had these moments too! Praise the Lord, thru our wonderful Pope Francis! God Bless one and all. Thank you Lord, Jesus, Pope Francis. He is strong, wise, patient and LOVING!! We support you all the way! I pray every morning for Pope Pa because I couldn’t imagine how I would feel to live on his schedule although I am 20 years younger than he is. It is of great love to consume oneself, to fulfill his mission as Pope, .. It is a life without oneself – a sacrifice in my eyes. I am glad this picture serves to remind us of this. tiring yap…….that is why he kept on asking that we all pray for him….he needs it…. I agree with the statement regarding Pope Francis’s vulnerability. The word that comes to mind is transparency…what we see is his humanity! Thank you for sharing this picture! ANOTHER DEMONSTRATION OF THE WAY HE IS…MAYBE HE WAS SO TIRED AND SLEEPY…HE FEELS ALL OF US FEEL, I ADMIRE HIS ESPONTANEOUS BEHAVINGS. I seem to remember that every time someone snapped a photo of Pope Benedict looking tired, there was great concern about his frailness. When John Paul II looked or acted tired, people started carping about how the job was too much for him and he ought to consider resigning. This pope looks tired and he is “just human”. I love it. It reminds me of the times when I was young and would ask about the everyday things that Jesus himself most certainly did but no one ever recorded because it was mundane. Pope Francis has certainly brought me back to those innocent memories and the wide-eyed awe with which I once looked at the world. This picture makes me smile. Please! More of him being human! Someone before me said pictures like this help non-Catholics (and we Catholics!) catch on that we understand he’s not God. Blowing his nose, well no. But him just looking around while being driven somewhere, or flying, or praying, or heck! just waiting. Paul Harding, thank you for publishing my comment and especially writing such a wonderful piece on a truly inspiring and compassionate man………….BTW, I love in my confirm email how you greet people with “HOWDY”………..you must have some Southern or Mid-western blood in you!!! AMEN!! God Bless You Paul! And God Bless our wonderful Pope Francis! You look tired your Holiness. You need to go to bed earlier and try to rest during the day. Too much work for you. I find it to be glamourous as usual and then again so is he. Glory be to God. Amen. Seeing this reminded me to pray for our beloved Pope. His vocation is beyond demanding physically, emotionally and spiritually. God bless you Pope Francis! Love it!!! Finally a pope that shows expression. He is one of us, HE is Christ walking among us.. Bless the pope and those who don’t believe, thank you PAPA FRANCESCO for being you. adorable. thank you for taking and sharing this moment! I loved the whole video of our Blessed Pope Francis, especally the last frames which show his smile and grace and the peace that shiines within. GOD Bless him and how blessed are we to have him in our lives. Missing Pope Benedict ……. He was True to His Faith…. Macaulay Culkin … later on life as Pope Francis I hahaha. If you didn’t get the drift, watch “Home Alone.” The similarity is uncanny. Love to see the Pope being human. It’s one of his most endearing qualities. Pope Francis you are such a grace-filled person and full of love for Our Lord, which everyone who sees or reads about you feel drawn to Almighty God. Thank you and God bless you always. God bless our Pope Amen. Para mi no son momento ordinarios….Son momentos de grandeza entre el ser humano y Dios…Es la coneccion del trabajo de un hombre al servicio de nuestro altísimo…!! Of course it shows the humanness of this Holy Father for he is using so much energy in all that he does. A great photo of the man! We need to pray for him and his level of energy. God has blessed us with this wonderful human being. This Pope is true to the Faith…he lives it as St. Francis did and as Christ did, doing His Father’s work among us all! God will bless u more our beloved Pope. Thank you for being one of us..Thank you for that simple act of humility and simplicity.. I really love the pope’s emphasis of our humanhood. it is in our being that we experience God’s mercy. Pope Francis is so real. He is a breath of fresh air for the Church. God Bless Pope Emeritus Benedict !! He did not Destroy the True Mass, like Pope Francis is Doing.. The Very Mass that Our Lord Created while on This Earth.. God Have Mercy on Us All !!! We Must Live in This World But Not Of the World, As St. Francis all the Saints Did !!!! Thanks, Greg, for your question. I’ve never witnessed the pope applying hand sanitizer. I’m certain he has “the smell of sheep” on his hands. I saw this article and thought to myself…how long would I last if in any given day I only had 4 seconds of down time? Amusing, give the guy a break! How beautifully natural. Papa belong Yu Mi Fella. There’s so much I love about him, he seems so real, just like one of us & this pic is a perfect example of his humanness. There’s something very cute & sweet about him too, like he’s everyone’s Grandpa. Es nuestro PAPA, NUESTRO, ARGENTINO !!!!! !, es natural, humilde, auténtico, es todo AMOR, sonríe, siente, llora como nosotros, ama, es un ser humano EXTRAORDINARIO., toda Argentina reza por ti !!!!!!! . Following this moment to refresh our dear Pope surfaced with a smile not unlike the parent that rises to feed their infant during the night. Though exhausted and tired what loving parent will not smile back at the child that lovingly trusts them. This is how I am certain Pope Francis sees us all…so return the smile. He’s is just so cute! Personally ,I have liked it…so human..like Jesus..He did such things when He took Flesh…. Am proud of him. It is very normal to be human. God bless you Dad and give you graces to carry out his mission .Long Live……………..
Pope Francis is a wonderful, human, role model for all humans! He shows us and tells us how to love others as Jesus has done. God bless Pope Francis! Paul, Thank you for sharing this picture and for your comments too. … God bless the Pope. Papa Francis truly has shown us the benefits of adoration, the rosary, daily Mass…without Christ, he can do nothing, he lacks the strength and graces needed…but with Christ, he can do all things! Amen!